New York State's Finger Lakes region is indeed a paradise for recreational cyclists. In addition to the lakes themselves -- closely grouped, deep, cool "fingers" among the hills -- cyclists will find waterfalls and gorges, wineries and museums, cities and farms, all connected by an extensive network of well-maintained roads. Mark Roth and Sally Walters's collection of tours has long been a trusted companion of cyclists in the Finger Lakes region. Now the members of the Thursday Night Men's Club (TNMC) -- a club devoted to hiking and outdoor recreation in the Finger Lakes -- have revisited and revised each scenic tour. 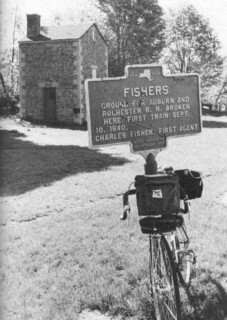 Backroad Bicycling in the Finger Lakes Region includes clear, mile-by-mile directions; detailed maps (with cues): and notes on the history and culture of this unique region. Mark Roth and Sally Walters have hiked across the U.S., Europe, and New Zealand. They have written about their travels for the Christian Science Monitor and many other publications.